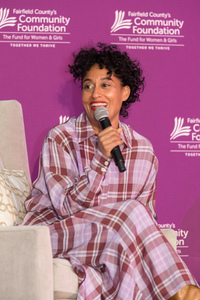 Commemorating its history of community impact, Tracee Ellis Ross was the featured keynote speaker at Fairfield County’s Community Foundation’s Fund for Women & Girls Annual Luncheon. More than 800 friends and supporters from Connecticut and beyond were part of this celebration held at the Hyatt Regency in Greenwich, Connecticut, on April 4, 2019. The empowering theme —BRAVE. BOLD. YOU. — applauded the heart that supporters have steadfastly brought to empower women and girls in the county for more than two decades. The estimated gross proceeds from the 2019 luncheon was nearly $600,000, exceeding this year’s fundraising goal. Fund for Women & Girls pioneer, Anne Leonhardt, contributed seed funding that ultimately launched the Fund in 1998. In honor of her legacy, the second Anne S. Leonhardt Award was bestowed upon Vicki Craver, a longstanding supporter of the Community Foundation and The Fund. Craver was recognized for her community leadership and philanthropic efforts to strengthen Fairfield County. Stamford Health was the Presenting Sponsor for Fairfield County’s Community Foundation’s Fund for Women & Girls Annual Luncheon. In addition, Annual Luncheon champion sponsors included TD Bank; Deloitte Services LP; Eversource; Koskoff Koskoff & Beider, PC; Manatuck Hill Partners LLC; NBC Sports Group; Neuberger Berman; People’s United Bank; Pitney Bowes; Spinnaker Real Estate Partners LLC; UBS; United Bank; Wells Fargo Private Bank, Ethan Allen and Nielsen’s Florist and Garden Shop. Media sponsors included Media Partner - Hearst Media Group Connecticut, Moffly Media, Star 99.9 and 95.9 the Fox.